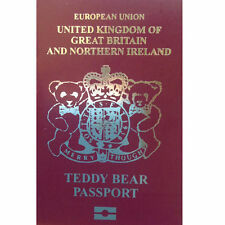 Merrythought Teddy Bear's Passport - perfect for bears that like to travel! Here is a sweet little teddy bear sweater! It has a cute penguin embroidered on the front of it. These are made to fit a 10" to 12" teddy bear. Torso Length 4.25". 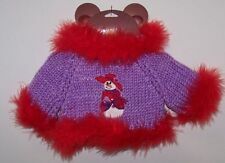 Adorable Doll or Bear Clothing Sweater. She is nice and dressed her in one of my repro outfits. Limbs seem to be ok. (SEE PHOTO). Hair is thinning on back. Great Gift and addition to your Teddy Bear Collection. Made by The Bear Factory. 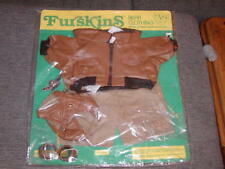 The jacket has a full zipper, elastic knit cuffs, fur collar, attached scarf and is made of tan colored vinyl. The clothes are made to fit a 16"-22" sized bear and the cuffs on the pants can be turned in for smaller sizes. 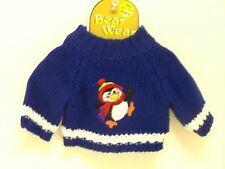 This auction is for 3 new BABW clothing items. They have not been used but could use a good cleaning from being stored. Please email any questions and check out my other listings. I will combine shipping on multiple wins. Thanks for looking! The tennis racket looks different than the ones I've seen with this doll, so I will say it's not an original bild lilli. She is just beautiful and near mint. I do not see any flaws or issues. 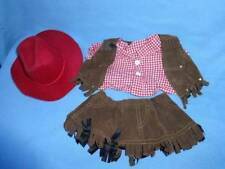 Blue Jean Teddy Outfit New. Condition is New. Shipped with USPS First Class Package. Orange & White Cheerleader Uniform Fits Most 8"-10" Webkinz, Shining Star and 8"
Very minor surface scratches around dog's eye and slight abrasion to glaze on back of plate. It consists of a golf bag and 6 clubs. NOTE: Bear model is not included. TEDDY BEAR KARATE Uniform CLOTHES Fit 8"-10" Build-a-bear and many others. 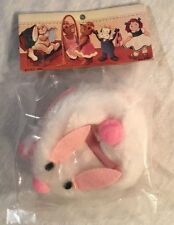 Great Gift and addition to your Teddy Bear Collection. Made by The Bear Factory. New Listing3 1/2" Blue Brushes For Dolls or Crafts, Lot of 20, "Ava Stars", NEW! Lot of 20, New, Never Used Blue Hair Brushes for Dolls or Crafts. 3 1/2" Long. Says "Ava Stars" on back. 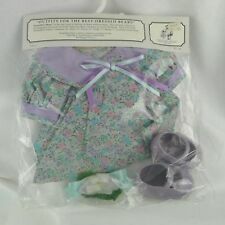 Teddy Bear FLANNEL PJs Fit 8"-10" Build-a-bear and many others. Great Gift and addition to your Teddy Bear Collection. 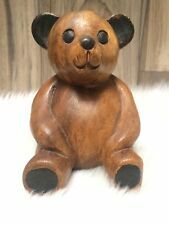 Made by The Bear Factory. Piper-Lee Bear Wear Collection: Handknitted Black Scarf with Purple Ribbon Trim (bear not included in the sale item). This scarf is black with deep purple satin ribbon ties as a trim. The ribbons are simply tied through the stitches and can easily be removed or replaced with another colour. Tender Heart Treasure Teddy Accessory 82082 HUNTER GREEN GOLF BAG w CLUBS, 5"